Like all sewing projects, we will begin the Aster sewalong by gathering fabric and supplies. I love this part of the project! Choosing the right fabric to match a pattern is a fun task that I never tire of. 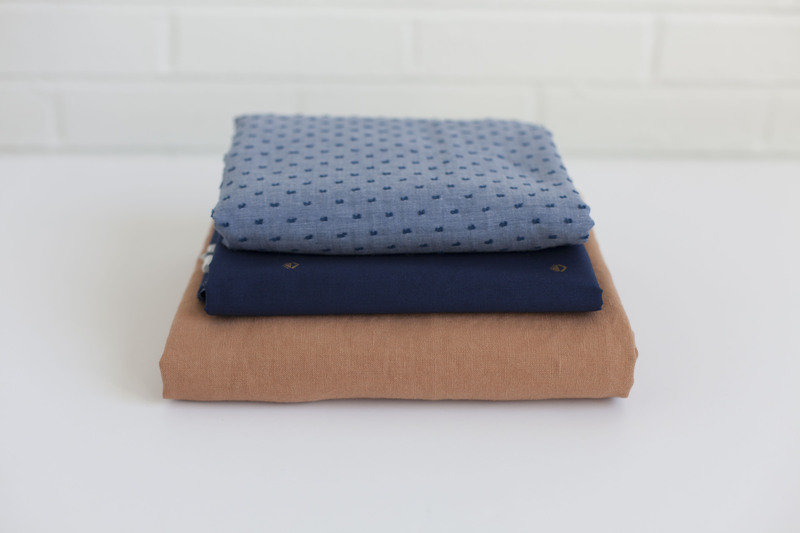 Main Fabric: For versions 1 and 2, you’ll want a medium to lightweight woven fabric. 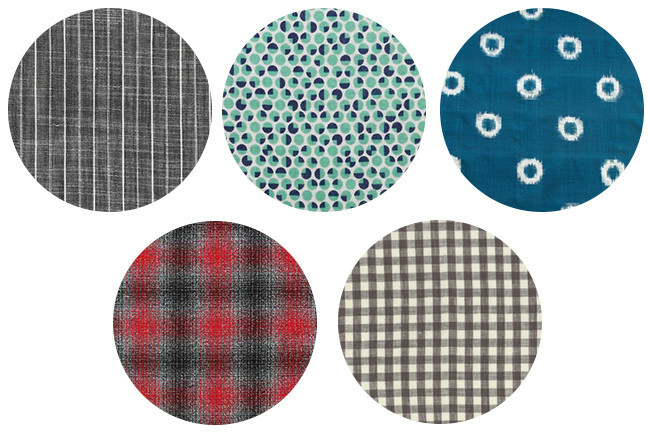 Chambray, poplin, shirts, and even linen will flatter these variations beautifully. For version 3 chose a light to medium weight fabric with substantial drape. This will allow the flutter sleeve to fall delicately, rather than stick out. Rayon challis, cotton lawn, or silk crêpe are great options. Interfacing: All versions will require interfacing to stabilize the placket. Version 2 requires additional interfacing for the sleeve cuff. Buttons: All versions require six 5/8″ buttons, version 2 requires two 3/8″ button to finish the placket. Bias Tape: One yard of 1/4″ single fold bias tape for finishing the neckline. You can also make your own bias tape, but you will need to purchase 3/8 of a yard additional fabric. A note on the pattern: The Aster pattern contains errata, which should be noted in an insert with your pattern. If you did not receive the insert, see our errata page for the details. For versions 1 and 2, choose a medium to lightweight woven fabric. It is important to find a fabric with a good balance between structured and light. Fabrics that are too heavy will lay stiff and awkwardly from the form, but fabrics that are too light may be transparent or cling. Cotton shirting is a classic option that strikes the perfect balance. Cotton chambrays are a great trendy but neutral option. Linen is perfect for a chic warm weather blouse. Or try a lawn will a colorful print. The feminine flutter sleeves featured in version 3 call for a more delicate fabric with lots of drape. Rayon challis is a gorgeously soft option that will provide drape and movement. If you are up for a challenge, try making a version out of silk crêpe. 4) Chambray Jacquard from Fancy Tiger. Fabric shears: to cut your fabric. A rotary cutter can also be used. Tape measure: for taking accurate measurement s of your body. Pins: For cutting and sewing. More pins= more control! Water soluble marking tool: since we will be marking on both the right and wrong side of our fabric, make sure that your marking tool is water soluble. Clear ruler: for putting your pattern on grain and marking your hem. Seam gauge: this tool is handy for taking small repeated measurements, like on the shirt placket. Seam ripper: just in case! 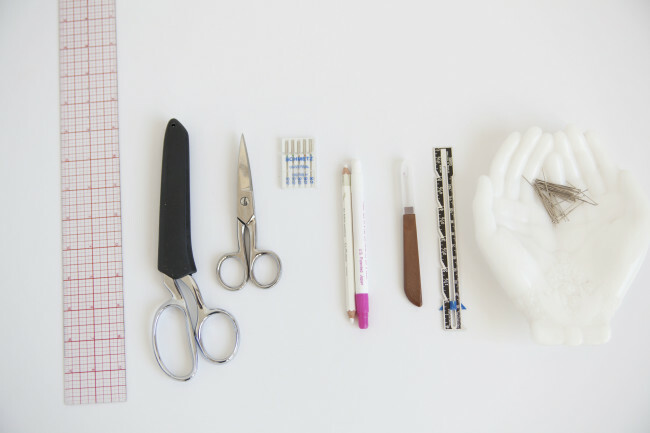 Machine needles: choose a needle that is appropriate for your fabric. For medium weight fabric use a universal size 80/12. For lighter-weight fabrics use a smaller needle like a microtex 70/11. Prewash your fabric in the manner you plan on caring for the finished garment. I never skip this step. There are few things more disappointing than working hard on a project only to have it shrink the first time you wash it. If you are choosing a fabric with a high shrinkage rate, like rayon, be sure to buy additional fabric to compensate for shrinkage. Next week we will cover cutting, fitting, and both full bust, and small bust adjustments. Is there a general rule for choosing the weight of your interfacing? Is it generally based on the use within the garment or the weight of the fabric. I was planning on using a very light polyester for the muslin and a chambray for the finished shirt. Matching the weight of your fabric to the weight of your interfacing is usually a good rule of thumb. I’m a little confused as far as interfacing goes. Do I buy a lightweight interfacing? More rigid? Is there a specific Pellon interface anyone can recommend? I generally match the weight of my fabric to the weight of my interfacing. In the case of the Aster, I would recommend a lightweight interfacing to compliment the light to medium weight fabric. Im very new at this. Including understanding fabric. You listed the fabric types but I have no idea which ones are recommended for which style/version of the pattern. Can you clarify? I would like to sew all three at some point. But to start I like the plaid flannel. Which version is that recommended for (long sleeve)? Thank you. Hi Lisa, thanks for joining the Aster Sewalong. It is a really good place to gain supplemental information as a beginner, and even beyond. Plaid flannel would be well suited to all views, but the flutter sleeve. Flannel has a tendency to catch on itself (not totally unlike velcro) this quality would make the flutter sleeve drape awkwardly. Remember that when working with plaid always purchase additional fabric to accommodate for pattern matching. 1 yard extra will probably do the trick! Thank you for that tip. I got a little excited too early and didn’t order enough plaid but I ordered a second one of cotton and I hope I can get started with a muslin first of Version 1 and then use the cotton one for my first finished Aster. I’m super excited. What version were you planning on making? I think this would work well for versions 1. The pleats in version 2 might make for some abstract octopi. 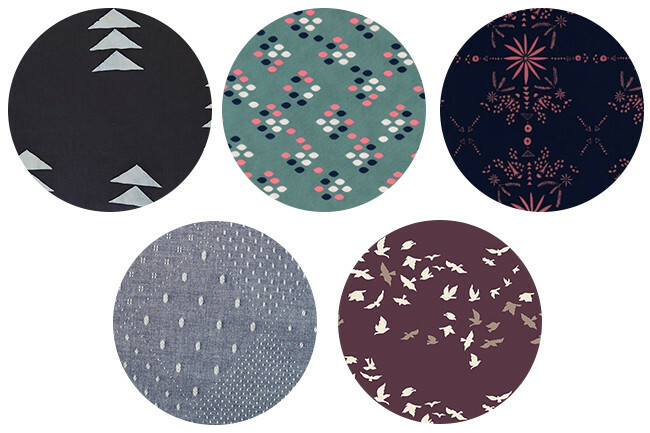 I love the colors in this fabric, Cotton+Steel have some pretty gorgeous prints and color ways. I’m looking forward to making a blouse for myself! I have a fabric in mind, it is a 100% cotton sateen. Would that be appropriate for the short-sleeve version, or do you think it might be a bit too heavy? A cotton sateen would be lovely! What do you mean by a 1/4 inch single fold bias tape? Is the finished width 1/4 inch? 1/4″ refers to the finished width of the bias tape. So the tape is quite narrow then? I’d start with a 1 inch bias strip to make a 1/4 inch bias tape then? I meant start with a 1/2 inch bias strip? It is pretty narrow, but this makes for a very clean finish at the neckline. For 1/4″ single fold tape, you will want to start with 1/2 bias strips. I am confused? Finished width when sewn in? All the I could find at Joann’s is single fold .5 wide. I tried cutting bias strips that were 1/2″ wide but 1/4 fold on each side leaves no fabric. 2nd attempt with. 1″ strip. It worked but is that too wide? It can be challenging to find pre-made 1/4″ bias tape. I like using this bias tape maker, I find it to be really helpful with the narrow width bias tape. On particularly challenging fabrics I will cut my bias strip to be 5/8″, which can also be helpful. So I purchased fabric today. I am going to try to make two tops: versions 2 and 3. Both casual, # 3 is a pretty gauze. Now, question — how would I make to gauze top less see through? Could I just make a double layer of gauze for the front? Lining Aster wouldn’t be ideal. If you were to line the front I would suggest using silk or rayon lining so that the cotton fabric doesn’t catch awkwardly on itself. Just baste the edges of your self and lining together, then treat the joined pieces as one. If your fabric is transparent use french seams for straight or slightly curved edges and bind the armholes. Basting your “self and the lining” might be quite painful. Would a double gauze be a good choice? Double gauze would be a lovely choice. Be mindful as you choose the color, as sometimes light colored double gauze can be a little transparent. This is a question, really. Today I was tracing my size from the pattern and have run into a bit of a problem. On Piece A, bodice front, version1 and 3, there is some confusion on which line to trace for the dart for a size 10. If I follow the size 10 line up, I’m on size 12. If I follow size 10 down, I am on size. I just took a closer look at my Aster pattern, and I see what you are saying. The numbers are really close together, but the size at the apex of the dart (not to the side) is the correct marker. You will be in good shape as long as you long as you follow and mark the 10 line. That last line should have read from ten down to size 8. Can you share where you got the fabrics in the photos above? I really love the navy with gold accents! I was just about to ask about that fabric too! 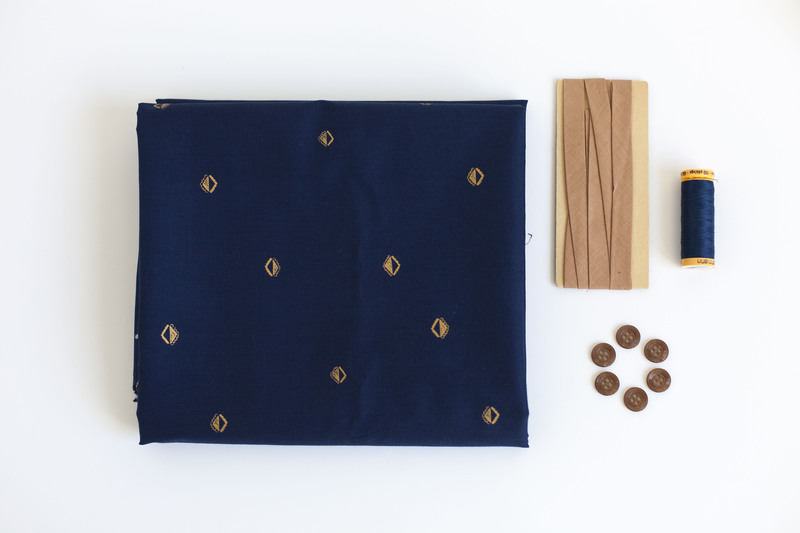 I bought the navy and gold fabric at a local shop, but you can purchase the same fabric here. It is a gorgeous lawn from Cotton+Steel. It is so dreamy to sew with!! Would this work well for version 3? love those flutter sleeves! That is the version I am using that fabric for, I think it will turn out nicely! Does it matter if the interfacing is woven or non-woven? I always prefer woven interfacing, it wears and washes better over time. If you are using a more delicate fabric like then knit interfacing would work nicely. This is my first sew along and I’m really looking forward to it. I’ve just begun sewing again after a 35 year hiatus. I recently took a garment class and the teacher always preferred self interfacing on shirts. May I use my fabric as interfacing? Does the interfacing need prewashing? If you are using woven interfacing that has a cotton fiber content, you can pre-wash by soaking in room temperature water, then hanging dry. I’ve made this pretty blouse once before, using a double gauze (nani iro) and I found the fabric worked well for the short sleeved version :) I made a bit of a mess at the top of the placket and the bias tape neck line though. This time I want to make the flutter sleeved version using a silk crepe de chine. I bought enough to make self-bias tape too, which I have not one before. Nervous as with this expensive but super pretty fabric! Hi there! It’s the first time I will take part to a sew along so I’m very excited about it! Regarding my measurements I don’t really know what to do because my bust and hips indicate a size 0 but my waist indicates a size 4. What do you recommand me to do? A size 2? Thanks! NB: I plan to sew the version 1. The Aster has a lot of ease. For a size o, the bust measures at 35″ and the waist at 33.25″. So even if your waist is measuring closer to 27, the 0 will still fit with plenty of ease. Excited to take part in my first sewalong. Weirdly had the Aster pattern since it was launched and last weekend found some red/white cotton ticking on sale to start making. The timing is great. I’m an intermediate sewer and most classes are too basic for me and/or I can’t make the times. Virtual sewing class is great to feel part of it and to do at my own pace. Off to start tracing the pattern pieces. Looking foward to the class on adjustments as I have really narrow back and large bust; narrow shoulder adjustmebt and FBA always required. Going to make version 1 with the pleats from V2. Going to cut the back yoke and pleats to give horizontal stripe. Do you recommend we create a muslin top first. I have 2 pieces of “good” fabric I want to use but concerned I might make a mistake. I always recommend making a muslin, especially if you have a limited amount of fabric. Hi! I am excited to participate in another one of these fabulous sew-alongs! I am still a bit unfamiliar with fabric types for garment sewing, and still tentative about ordering online. I really like the look of the grey version one fabric shown in the email introducing aster to email readers. It had a paisley bias tape collar and portions of it were shown in circles to show different aspects of the construction? Even if you don’t know the exact fabric, what type of fabric is it? Thank you so much : )! Hi Jen! The fabric featured is actually a very pale green silk suiting. You can still find it here. I just opened the Aster pattern. In the errata, not only correct instructions for p.14 are included, but also a replacement bodice front to tile & tape. I’m confused: When I opened the pattern, there was a separate note about the directions correction on p.14, but no mention of the replacement pattern. Not sure what to do? Go with the paper pattern I have, or replace the paper bodice with the tiled & taped pattern? It depends on what size you are making. If you are sewing a 14 or larger, I recommend printing a new front bodice, just to make sure everything lines up perfectly. Yes, I’m a “14 or larger.” Thanks for the clarification to print out the new bodice.